My money (and pretty much every other Trek fan's money at this point) for the villain of the piece is on Gary Mitchell. In the original series, Mitchell was Kirk's best friend who was granted god-like powers after smacking into the Galactic Barrier. Gary Mitchell as the villain of Star Trek Into Darkness makes me a whole helluva lot happier than trying to force Khan on everyone. Mitchell isn't quite what you'd call iconic, but the character has a lot of room to become iconic. 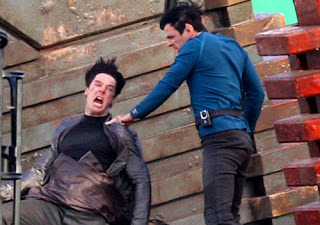 And in the hands of an actor like Cumberbatch, we may finally well get a Star Trek big bad that gives Khan a run for his money.